Welcome everyone to a fantastic new year and I know it will be an outstanding racing season. With many drivers, crew members and sponsor changes in all the racing divisions, it will truly be an interesting season. I sincerely hope that all have made the decision to make safety a major part of their rebuilding process for the upcoming season. We are in the process of scheduling our 2002 MARFC Fan Club Days at our membership tracks. Be sure to check out the Events page for dates and information for those, and the rest of our general meetings throughout the 2002 season. 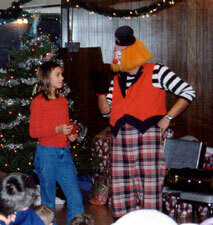 Don’t forget our 36th Annual Awards Banquet will be on January 19, 2002. Be sure to get your tickets soon. Contact me for more information at president@marfc.org. Deadline to purchase tickets is January 16, 2002. Have a great racing season. 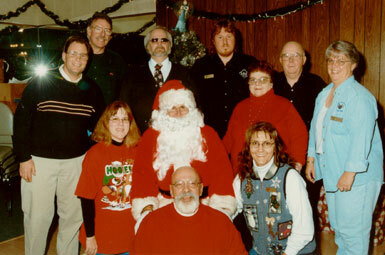 As usual, the Children’s Christmas Party was the December Meeting with a brief board meeting held afterwards. 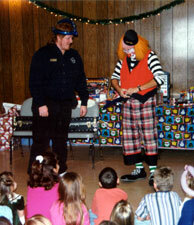 The kids were entertained by Fidget the Clown and Willie the Clown while anxiously awaiting Santa’s arrival. Our Vice-president just could not stay out of the way and was snagged by Fidget to assist with the show. Fitget put on a wonderful show of magic and other tricks for the kiddies. This young lady was convinced that all attempts to restore a glove to its original size had failed. From the MARFC Family, Here’s hoping all your Holiday Wishes came true!